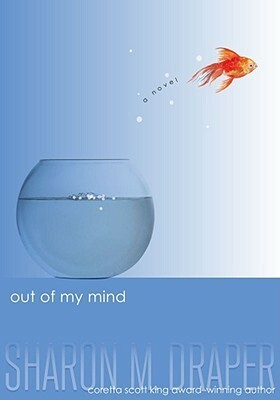 We had a great book discussion in January about Out of My Mind by Sharon M. Draper. Sixteen participants were present, making this our largest book club so far! Thanks to Abbie, Alexandra, Ben, Cecilia, Colette, Evan, Jesse, Julia, Kelsey, Molly, Natalie, Olivia, Olivia, Rileigh, Riley, and Sofia for attending! Please read some of the comments about the book below. -"I felt sad at first. At the end, I thought that it was good that she was able to talk through the Medi-Talker." -"My first impression was 'weird'. The last was 'amazing'." -First: "who is this?" Second: "slob"
-First: "sloppy and gross". Second: "wonderful". -First: "I feel bad for her". Second: "amazing". -"sorry for her" and "proud of her"
-"gross" and "brave, strong, noble and smart"
-When she's at Mrs. V.'s house and her Medi-Talker arrives. -At the doctor's office when the mom yelled at the doctor. -After Melody missed the plane and the last scene of "why did you leave me?" -When Melody met Mrs. V.
-When Penny gets run over, the scene was really well done. I could see it in my mind. -When they were at the Whiz Kids contest and Melody answered the question right. -When Melody got a 100 on the test and she got into it. Everyone thought she was so dumb and she did really well. -When Melody got left at the airport. It was a really sad scene. Her teammates were mean to her. -When they left Melody at the airport. It was so much more interesting to leave her there. You thought that she'd win the competition. -When Ollie jumped out of the fishbowl. She was trying to get her mom's attention and couldn't do it. -When Mrs, V. told her that she won tickets to the aquarium and she spelled out Rose. -When Melody got the dog, Butterscotch. I thought it was a cute scene. -When Melody was at Mrs. V's and she got the Medi-Talker. -When the fish jumped out of the water. It was a very easy picture for me to imagine. -I didn't like the ending because it's not that happy. I wish Melody had gone to the Whiz Kids competition. I don't like that they got 9th place and that her team betrayed her. -I liked how when they placed the trophy on the tray. Melody broke the trophy and stood up for herself. -I didn't like the ending because it led up to a good ending. But then they got 9th place. How could they just leave them at the airport? -I didn't like the ending because it was sad. At the end, she said something that I didn't understand. It was just very sad ending. I don't like sad ending. -I liked the ending because Melody's sister is okay after being run over and his team won 9th, which isn't first and it isn't last. -I liked that they got 9th place. If they hadn't left Melody behind, they would have gotten a better ranking. They should have known that they'd have a longer ranking without her. -I liked the ending of the story because there were big events at the end of the story. It wouldn't have been as exciting. -The ending was cool because Penny got hit by a car. The Grade 3-4 Book Club selection for February is From the Mixed-Up Files of Mrs. Basil E. Frankweiler by E.L. Konigsburg. "Having run away with her younger brother to live in the Metropolitan Museum of Art, twelve-year-old Claudia strives to keep things in order in their new home and to become a changed person and a heroine to herself."--summary. Copies of the book will be available behind the Circulation Desk within the next week. Please remember to register for Book Club so that we know how many people will be attending.